When we opened our restaurant in Brooklyn more than 13 years ago, I wanted a restaurant that reflected the food I grew up with in Florence. It was in fact a pretty traditional restaurant, for Italy that is, for New York, it was all new and adventurous. The only exception to the very Tuscan menu was a whole page on salads. And though salads are always available in any restaurant throughout Italy, they are usually a side dish or a way to end the meal with cheese. “Insalata” usually comes in two forms: green or mixed. If you are lucky, the green one will be a mix of wild lettuces, arugula and whatever else is in season, but it can also be a sad little dish of plain lettuce. The “insalata mista”, will be the same as above + grated carrots and tomatoes and sometimes corn… woohoo! All of it served with a condiment tray with olive oil, vinegar (not balsamic), salt and pepper. In our restaurant, however, I wanted salads that would surprise you and flavor combinations that would wake up your palate or allow you to end the meal on a perfect light note. And so it was. In my cookbook “The Challenged foodie” I dedicated a whole chapter chapter to my beloved salads. So why not a simple post on my blog with just a salad? Salads are delicious, refreshing, filled with vitamins and minerals and gorgeous; so here it is. I used both “radicchio tardivo” a long sweeter version of radicchio and “radicchio di Calstelfranco” a gorgeous white and pink radicchio shaped like a butter lettuce but with a nice bitter flavor. So for 4 people use one of each. Mix all in a nice bowl and voila. Previous Post Did you miss me? 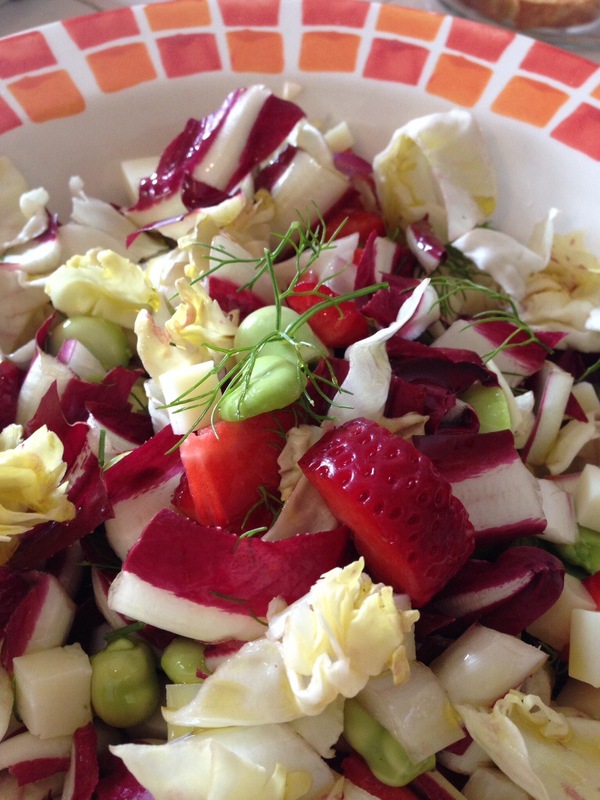 I wish my daughter liked radicchio… But if I have guests, this will be the salad I make! yummy.